Vitalityweb Backstore Ordering Information and Contact Page. San Diego, California Poway store contacting us via online e-mail, mail, fax, phone information. Times are not guaranteed and larger items such as chairs generally take a little longer. Shipping Policy - Vitalityweb attempts to ship your order within 24hrs of being placed unless the product is on back order or special order status. Orders placed on weekends or holidays are shipped the following business day. 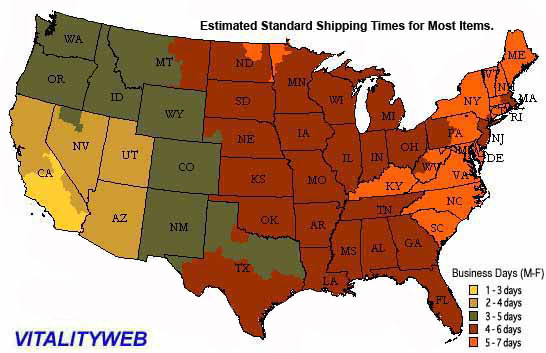 Standard U.S. orders are shipped UPS/FedEx Ground with online tracking. USPS Mail Shipments are shipped only twice a week and have an estimated delivery time of 1-2 weeks for most items. Express 1-2 Business Day Delivery and 2-3 Business Day Express shipping is also available on most items. Standard and Shipping Included rates are for most addresses in the lower 48 states only. Some remote, island or other difficult to access locations may be extra. If you know you are in a remote or difficult to reach area it is best to contact us before ordering so we can check the shipping rates to your address. You can also call our office at (800) 796-9656 or (858) 218-1320 for ordering and availability. In order to protect our customers, most packages do require a signature on delivery. If you would like to have the package left at your home without a signature, simply fax us a signed note and copy of your photo ID (888-796-9469) authorizing the package to be left without a signature. Please note that in most cases you are waiving your insurance and you could be responsible if the package is lost, stolen or damaged. All we can do is provide proof of shipment. If an item stated as brand new is found defective on arrival or an incorrect item was shipped, the buyer understands that the product will be repaired or replaced at seller's discretion in a reasonable amount of time. All presumed defective or wrong items must obtain a Return Merchandise Authorization Number before returning. Product warranties are offered by the manufacturer and will be honored by the manufacturer. Any shipping and handling fees will not be returned in any case. If an order is refused for delivery or an order is canceled after it has already been shipped, two shipping fees will be deducted prior to refunding since we are billed shipping both ways from the shipping company. APO's & PO's - we can ship our products to APOs, other military addresses and PO Boxes if you select USPS Mail when ordering. Some items such as massage chairs, recliners and perfect chairs are far too large for USPS Mail shipping. International Customers: We do ship most of our products internationally (Except Herman Miller products). Pricing depends on weight and destination. Please e-mail us a list of the products you are interested in and your address for shipment options and pricing. We do not cover import duty and/or taxes, nor do we know what these fees will be for your order. You will be responsible for any and all of these fees charged by your country. Should you not pay your Customs Import Duty/Brokerage Fees to the shipping company, we will charge the fees to your account plus a $10 processing fee. Sales Tax - ONLY California State Residents will be charged 7.75% sales tax. We will not charge sales tax to residents outside of California. Warranties- Any applicable product warranty problem, repair or replacement is handled directly through the manufacturer of the product. Gift Orders - You may have a product shipped to a friend or family member as a gift. When Checking-out, please specify Order by Credit Card online (separate billing and shipping addresses). Be sure to include the name exactly as it appears on the credit card, the address where the credit card bills are sent and the phone number of the owner of the credit card. Bounced Checks / Credit Card Fraud - Bounced/NSF/invalid checks are assessed a $25 returned check fee. Credit card disputes, Chargebacks and Fraud are assessed a $25 processing fee. Applicable Law - This Agreement shall be governed by and construed in accordance with the internal laws of the State of California without regard to its conflicts of laws rules. Any and all disputes that may arise between you and Vitalityweb/BackSport Health Products are to be conducted and under the jurisdiction of San Diego County, CA. General Provisions - Applicable Law - This Agreement shall be governed by and construed in accordance with the internal laws of the State of California without regard to its conflicts of laws rules. Any and all disputes that may arise between you and Vitalityweb/BackSport Health Products are to be conducted and under the jurisdiction of San Diego County, CA. Vitalityweb/BackSport Health Products limit of liability will never exceed the original invoice amount. If any part of this Agreement is found void and unenforceable, it will not affect the validity of the balance of the Agreement, which shall remain valid and enforceable according to its terms. This Agreement may only be modified in writing by an authorized officer of Vitalityweb/BackSport Health Products. This is the entire agreement between Vitalityweb/BackSport Health Products and You relating to any and all products sold and it supersedes any prior representations, discussions, undertakings, end user agreements, communications or advertising. We reserve the right to refuse any order. We do not offer a price guarantee on products we sell and prices are subject to change at any time without notice.